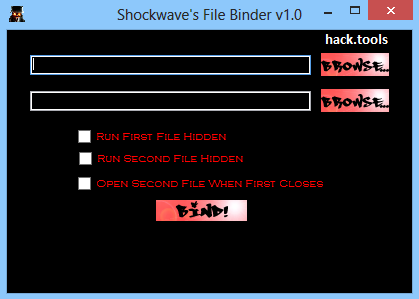 Just as the name suggests, a binder does exactly that- bind one file to another file. Some users refer to these type of tools as 'joiners', but whichever way you look It, they both serve the exact same objective. Whilst there are many reasons why people choose to bind two files together, binders are renowned as hack tools whereby a virus or any type of malicious file Is binded to a legit file. For example, unbeknown to the user executing the file, the legit one will show up whilst the virus will Install silently Into a directory on the user's PC. There are also genuine reasons to use binders such as playing a prank on a friend by sending him a particular file, and another completely different type will Install, both without malicious Intent. friend by binding one file to another that you have the legal right to do so.